AP Photo courtesy Getty Images via NHL.Com. In about 15 minutes, the Rangers will look to even the best-of-seven second round series against the Senators at Canadian Tire Centre. Yet another arena where naming rights change too much. It used to be Scotiabank. And god knows what else. 1.Play Ottawa 5-on-5. In Game 1, they were dead even in shots 28-28 and generated quality chances against Craig Anderson, who was good. 2.Stay disciplined. They took four penalties in the 2-1 loss Thursday. Too many. The Senators power play is more dangerous than Montreal with Erik Karlsson lethal. Plus Derick Brassard, Mike Hoffman, Mark Stone, Bobby Ryan and even Dion Phaneuf. It wasn’t even that unit that scored the tying goal. That came from Kyle Turris’ rebound right to Ryan Dzingel with Alex Burrows in front. The Sens generated a dozen shots on the man-advantage and plenty of momentum. That can’t happen today. 3.The big players must Step up. That means you Derek Stepan. His costly gaffe in Game 1 on what should’ve been an icing was inexcusable. As poor as the officiating was in somehow missing an easy icing, Stepan relaxed and it resulted in more attack time for Ottawa. Rick Nash was outhustled by Marc Methot, who made the key keep leading to Karlsson’s miraculous goal which deflected off Stepan and off Henrik Lundqvist’s mask and in. A play that could’ve been avoided. It’s time for Stepan to play like it’s the second round. Ditto for ghosts J.T. Miller and Kevin Hayes. At least Chris Kreider showed a pulse screening Anderson perfectly on Ryan McDonagh’s power play goal. 4.Keep the shots down. In Game 1, Lundqvist had to do too much. He faced way too many breakaways and second and third chances. He was outstanding in stopping 41 of 43 shots. But that recipe won’t work against the countering and speedy Sens. The Rangers must do a better job limiting the shots and danger chances. 5.McDonagh and Dan Girardi can’t be pinned in their end. They were a combined minus-32 in Corsi. Some of it wasn’t their fault. Guy Boucher got the match-ups getting Karlsson out with the Jean-Gabriel Pageau line with Ryan and Clarke MacArthur dominating the Mika Zibanejad, Kreider and Pavel Buchnevich unit. A momentum turning shift that eventually led to a bad Brady Skjei penalty which allowed the Sens to tie it before the second ended. Speaking of Skjei, he needs to be better. He struggled in Game 1. In fact, it was the much maligned pair of Marc Staal and Nick Holden who were the standouts. They can’t be the Rangers’ best. McDonagh and Girardi have to be along with Skjei and Brendan Smith. 6.Get more traffic on Anderson. He was very good in finishing with 34 saves to net the game’s first star. But he also didn’t have much traffic. Sure. He stoned McDonagh and Smith in tight. And stopped Zibanejad’s backhand wrap try. But Anderson didn’t have to work as hard as Lundqvist. Kreider did his job getting to the net. More Blueshirts must spend time there and make it harder on Anderson. Don’t let him get comfortable. Move him around and screen. Find the rebounds. They’ll be there. 7.More forecheck pressure. When the Rangers do it, they are very tough to contain. That means better efforts from Miller, Hayes and Mats Zuccarello, who was far too quiet. That line is probably the team’s best at cycling the puck. They need a good game. Stepan and Nash also were quiet. Only Jimmy Vesey was effective. It can’t just be the fourth line of Oscar Lindberg, Michael Grabner and Jesper Fast. The best players must show up. That’s pretty much it. The Rangers will win if they manage the puck better and do these steps. They don’t want to come back home down 2-0. Earning a split is important. It would give them momentum headed into a Game 3 at MSG. We’ll see if they can get it done. In other playoff related stuff, Cam Talbot is locked in so far against Anaheim. He was spectacular in Edmonton’s 2-1 win in Game 2 last night finishing with 39 saves. His rebound control was superb. Talbot and the speedier Oilers took both games against the Ducks at The Pond and are now headed home for the next two. The biggest surprise is their poise. I might’ve overlooked the Oilers’ speed. Connor McDavid is flying. So is Leon Draisaitl. And Adam Larsson has looked the best he has all year. Remember how much we laughed at that trade with the Devils for Taylor Hall. It’s no laughing matter anymore. Larsson and Swedish countryman Oscar Klefbom have formed a potent top tandem. But it’s Talbot who has outplayed John Gibson to put the Oilers in the driver’s seat. I didn’t think they were ready. But so far, so good. I wouldn’t count out Anaheim. Ryan Getzlaf is flying. They are relentless. They played a very good Game 2 outshooting the Oilers 40-23. But they obviously need more production. Game 3 should be interesting. As far as Nashville and St. Louis go, they split the first two games. The Blues got a late goal from Vladimir Tarasenko with 3:36 left. His second of the game. The Russian also made a huge block on P.K. Subban protecting a one-goal lead. He’s looked much more engaged this postseason. It’s amazing they held on. Nashville applied so much pressure in that final minute. A Roman Josi shot was redirected by Viktor Arvidsson right off the goalpost with 35 seconds remaining. The Preds look like the better team. But the Blues have Jake Allen and he made some huge stops late to preserve the win. I thought for as good as he was in Game 1 posting a goal and two assists, that’s how bad Subban was. He’s such a polarizing player. In Game 2, he had a great chance to put his team ahead on a 4-on-4. But missed wildly from the right slot high and over the top. Naturally, St. Louis came down and scored with a Tarasenko one-time rocket past Pekka Rinne for the game-winner. And Subban was awful in the final minute twice missing easy keeps that cost his team. Something you don’t expect from a player of his stature. Where are all the biased media today after that? Oh wait. Silent. Finally, Mike Milbury was at it again taking a shot at Subban for having fun during warm ups dancing to music. What is wrong with this guy? He’s such a clown. Milbury at times can be a good analyst. Controversial for sure. But when he makes such petty comments, he comes off as an out of touch bully who needs to go. The Pens and Caps are later tonight. Any chance Washington can eek out a win in Game 2 at home and tie the series or is that too much to ask? They need it. That’s gonna do it. I’ll have a full review of the Rangers/Senators afterwards. 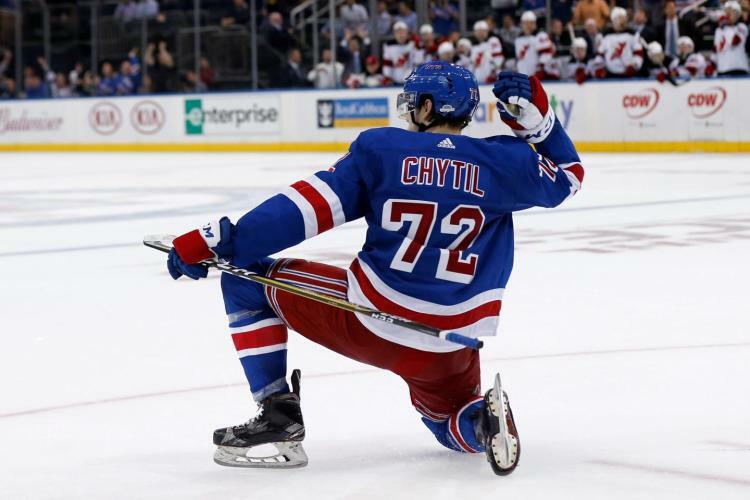 This entry was posted in Battle News, NHL Playoffs, NYRangers and tagged 2017 NHL Playoffs, Adam Larsson, Blues, Cam Talbot, Connor McDavid, Craig Anderson, Dan Girardi, Derek Stepan, Ducks, Erik Karlsson, Henrik Lundqvist, J.T. Miller, Jake Allen, John Gibson, Kevin Hayes, Mats Zuccarello, Mike Milbury, Oilers, P.K. Subban, Pekka Rinne, Preds, Rangers, Rick Nash, Roman Josi, Ryan Getzlaf, Ryan McDonagh, Senators, Vladimir Tarasenko. Bookmark the permalink.